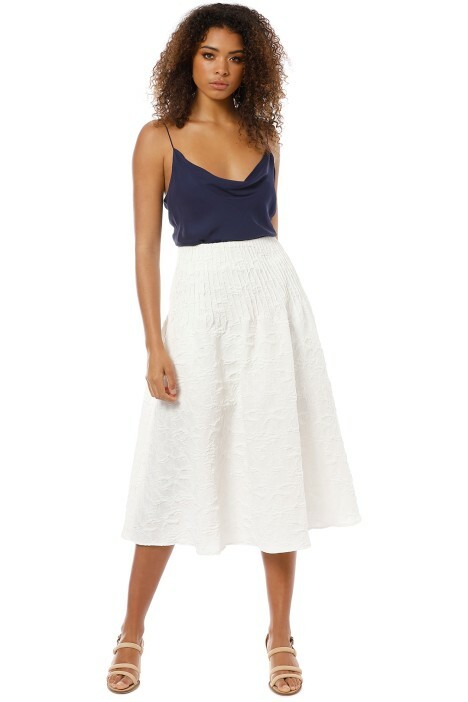 Make day to night dressing a breeze with the Brooke Textured Full Skirt by Friend of Audrey. Crafted from lustrous cloqué, the crisp white maxi skirt sits high on the waist and features pin-tuck seams to highlight your figure. Versatile and easy to dress up or down, rent it for a daytime event or a cocktail party! For an effortlessly chic daytime look, style it with a white knit crop top and hire a denim jacket to complete. Dress it up for cocktail hour by swapping the jacket for a pair of gold strappy heels. Read our blog for more tips on how to transform your day look for night!